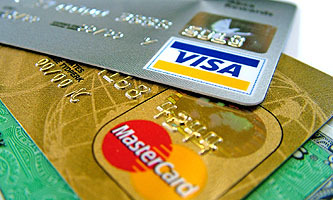 Although the exact rate charged on any given transaction varies widely depending on many factors, including the size of the business and the type of card, the average interchange fee in the U.S. is now about 2% of the value of the sale — two to six times the regulated rates imposed on Visa and MasterCard in Australia and much of Europe. ….Interchange fees now comprise a substantial share of the income these companies make on credit cards. In 2004, card issuers took in $28 billion in interchange. By 2008, that figure had shot up to $48 billion. That’s more than one-quarter of all credit card revenue and more than the total collected by banks in credit card late fees, over-the-limit fees, and ATM fees combined. Needless to say, merchants have no bargaining power at all here, since they can hardly stop taking credit cards and rules prohibit them from directly passing along the transaction fees to consumers. In Europe, transaction fees have been cut to 0.3%, but that took EU-level government action. This leads James to say that “piecemeal laws to protect consumers from a handful of the most devious practices will never get to the real problems. The answer to the credit card mess is a full fledged investigation by Congress, followed by meaningful regulation that takes in all the powerful players in the credit card business, including the banks that are at the bottom of it all.” Alternatively, there’s my proposal: round up all the credit card company CEOs and have them shot at dawn. Just as a warning to others, you understand.